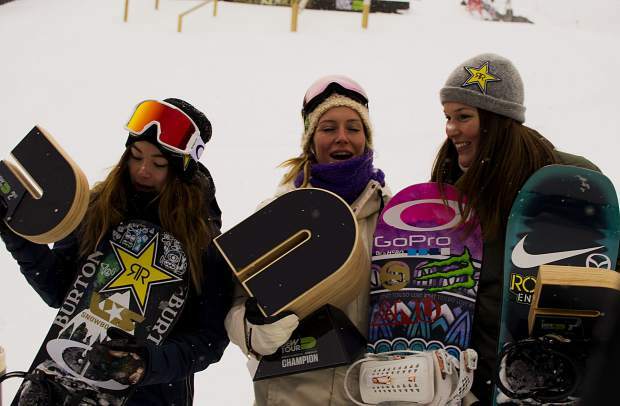 The Dew Tour women's snowboard slopestyle podium (from left): Hailey Langland, Jaime Anderson and Spencer O'Brien. 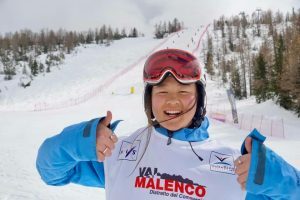 Organizers opted to cancel the postponed jump finals due to poor weather and awarded the top-three finishers from the Saturday jib finals with the overall titles. Ride team rider Brandon Davis tweaks an alley-opp on the 90-degree wallride feature on the Dew Tour jib course. 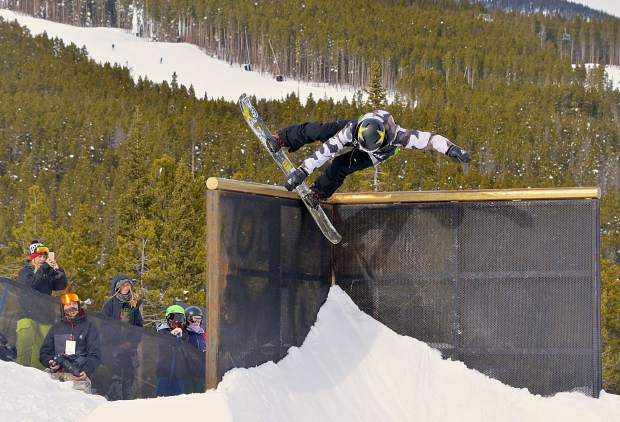 Davis and teammate Reid Smith took third overall at the brand-new snowboard Team Challenge on Sunday at Breckenridge. 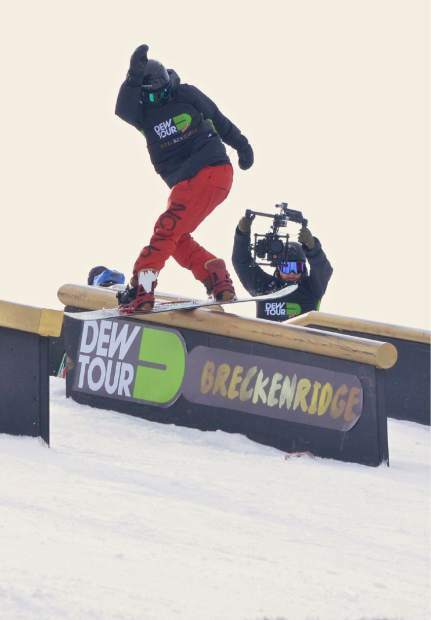 Burton team rider Darcy Sharpe on the first section of the jib course at Dew Tour in Breckenridge. Sharpe and teammate Mark McMorris combined on Sunday at the course to win the first-ever snowboard Team Challenge title. 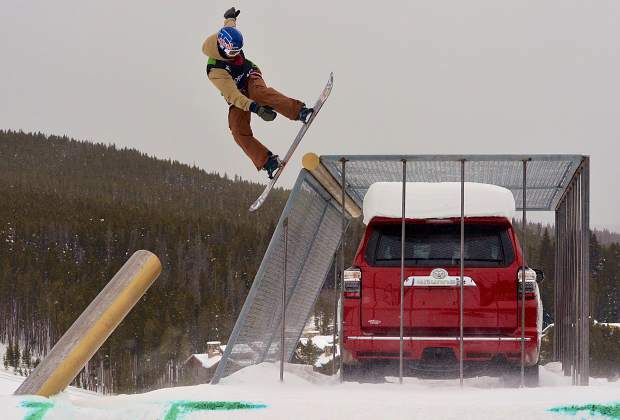 Nitro team rider Sebastien Toutant airs onto the chainlink Toyota feature on the jib course at Dew Tour in Breckenridge. Toutant and teammate Marcus Kleveland took second overall at the first-ever snowboard Team Challenge on Sunday. Nitro team rider Markus Kleveland spins a 270 onto the down rail in the first section of the Dew Tour jib course at Breckenridge. Kleveland and teammate Sebastien Toutant combined to take second overall at the brand-new snowboard Team Challenge on Sunday. 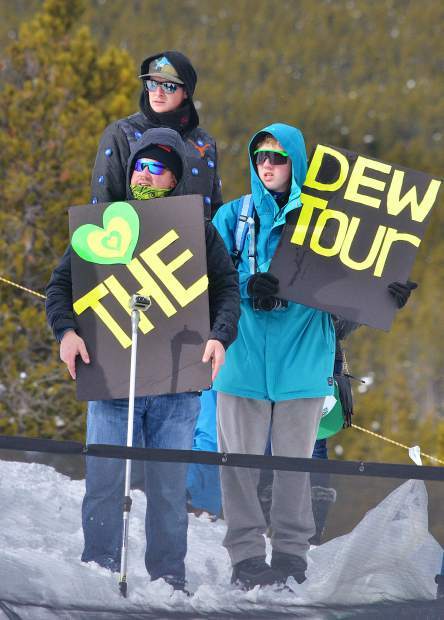 Scenes from snowboard and freeski slopestyle jib finals at Dew Tour on Saturday. The day started clear and blustery before another round of snow blew into Breckenridge. It wasn’t exactly the contest she expected, but Jamie Anderson won nonetheless. On Sunday morning, the veteran American slopestyle rider learned that she took the women’s snowboard slope title by default when organizers canceled the jump finals due to poor weather. The event had already been postponed once, but when things didn’t look better on the third and final day of Dew Tour, officials made the jib finals podium the overall podium. Anderson took first with 90.33 — the highest women’s jib score, ski or snowboard — followed by American teammate Hailey Langland in second with 86 and Canadian Spencer O’Brien in third with 80. 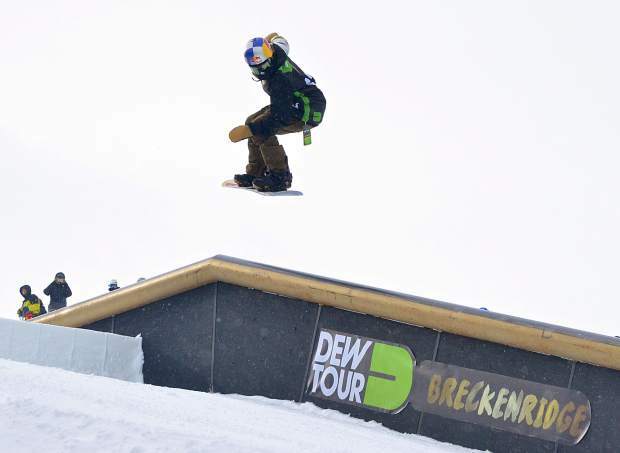 BRECKENRIDGE — Dew Tour has been good to Mark McMorris and Darcy Sharpe. Let’s start on Friday morning, when McMorris had an enormous and nearly perfect triple 1260 (as in three inversions with 3.5 rotations) to dominate the slopestyle jump finals with 95.33 — more than 15 points higher than Tyler Nicholson in second place. Later that night, Sharpe spun and pressed his way to a $5,000 grand prize at the nighttime street competition in the heart of downtown Breckenridge. Then, on Saturday morning — just a day after he turned 23 years old — McMorris wrapped a big, techy bow on his birthday slopestyle run with a score of 77.33 in the jib line to win the men’s snowboard title. Sharpe didn’t fare quite as well and missed the podium, but the duo still looked effortless on the custom jib course, with 270s both ways onto just about every feature and photo-ready tweaks on the Toyota 4 Runner in a grindable chainlink cage. 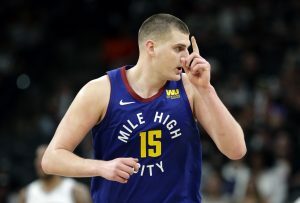 Now, the two are Team Challenge kings. On Sunday afternoon, McMorris and Sharpe showed their prowess on the slopestyle jib course to notch the highest combined score of the day, 171, and claim the inaugural Team Challenge title. Behind the Burton pros in second were the Nitro riders, Marcus Kleveland and slopestyle bronze medalist Sebastien Toutant, and in third was the Ride team, Reid Smith and Brandon Davis. The Team Challenge didn’t look at all like the original format. When it was first announced, officials envisioned a three-part contest, with three riders in three separate contests: jibs, jumps and the superpipe. But Mother Nature had other ideas, beginning before the event even came to town when superpipe was canceled due to low snowfall. 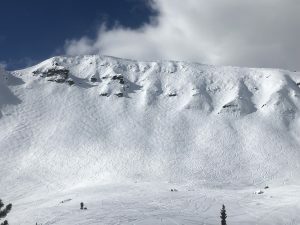 Then, on the morning of the competition — 48 hours and 13 inches of fresh powder after the first day of riding — organizers announced it was too blustery and snowy for jumping on the 65-foot hit. Instead, all team riders took three runs apiece through the jib course, and no one was quite sure what to expect. 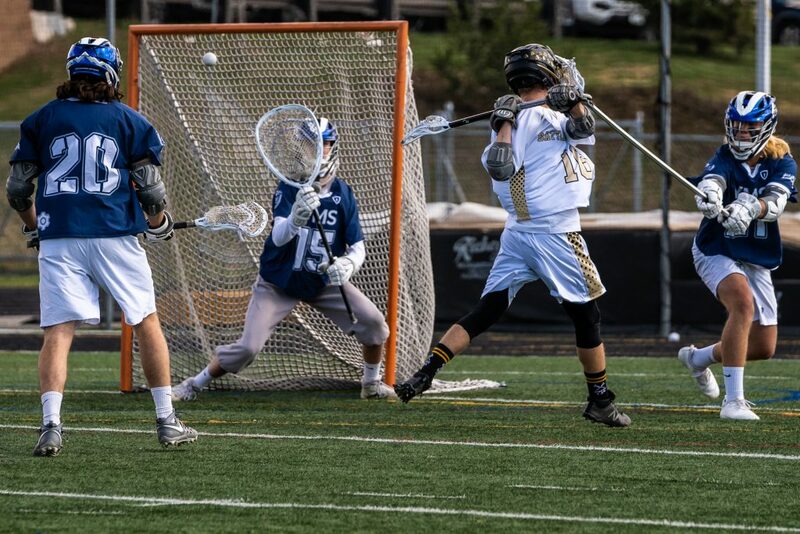 Would the last-minute change throw off jump specialists like Nicholson and Mons Roisland? Or would they rise to the occasion like the pro snowboarders they are? 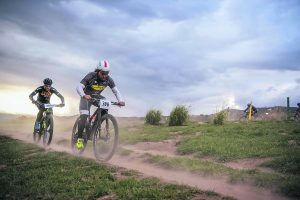 After all, the Team Challenge is all about showcasing the most well-rounded, bombproof brand in the business — jibs, jumps or whatever the conditions throw at them. And everyone put on a show. McMorris nearly repeated his winning jib run from Saturday with pinpoint spins on and off of every feature and smooth, crisp boardslides. Sharpe had an equally smooth but noticeably different run, featuring bigger spins and better butters than McMorris, who might as well be a hawk when it comes to amplitude. He had the highest score for snowboarders with 87. Will the Team Challenge return for a second year? Judging by the laughs and smiles and shenanigans at the base of the jib course, chances are good it’s here to stay. It gave relative unknowns like Hans Mindnich, the Snowboarder magazine 2015 Rookie of the Year, a spotlight on a national stage, all while throwing veterans like McMorris and Toutant a creative curveball. Not a bad way to welcome winter.